W1473SE - SILVER TONE BASEBALL "MOM"
Lead, Nickel & Cadmium Free! 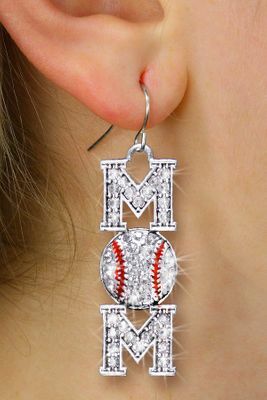 Detailed Antiqued Silver Tone Baseball "MOM" Charm Is Covered In Faceted Clear Crystals With Clear Crystals And Red Stripes On Ball. Comes On An Earring Style Of Your Choice: Surgical Steel Post Or Surgical Steel Fishhook.